When I was a kid and my mom served beets, I was not a happy camper. I can remember, however, going to a restaurant in Virginia as a newlywed and, for some reason, being inspired to order a beet salad. That salad completely reversed my previous stance on beets and was a recipe I felt compelled to recreate at home soon after. Over the years, I have eaten many versions of this salad, varying the nuts, cheese, and dressing. Pecans, walnuts, sunflower seeds, and pepitas all compliment the salad well. Blue cheese, goat cheese, and feta are all fair game. 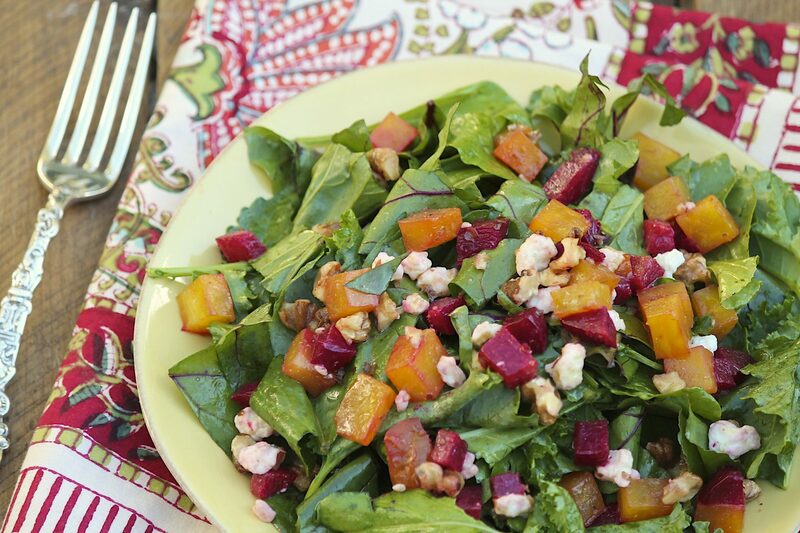 In this much-loved dressing, I use orange juice concentrate as it compliments the flavor of the beets so well. While I have created variations using freshly squeezed orange juice, I end up adding a bunch of other ingredients to achieve the thickness and tang achieved so easily with the concentrate. In my mind, it is worth buying a can for this one purpose! You may refreeze the unused portion or, of course, make juice with it. You could even stir a spoonful or two into a smoothie. Most recently, I have used avocado oil in place of my standard extra virgin olive oil. While either one will produce a delicious vinaigrette, avocado oil offers many benefits from a health and general cooking perspective. For more details on this lesser known oil–which is becoming more readily available–click here. 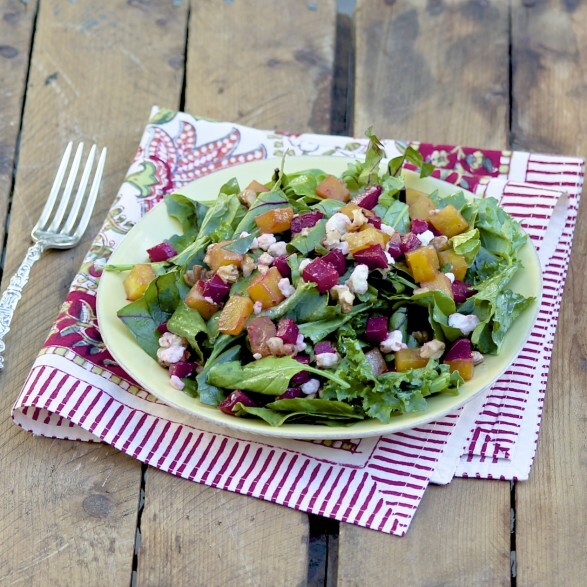 And if you are lucky enough to find freshly picked beets with the greens still attached, try some of them in the salad. Or sauté some chopped onion and garlic–in avocado oil, perhaps!–and add the chopped greens to wilt. Sprinkle with salt and pepper to taste and/or grate Parmesan cheese liberally overtop. To have this salad ready in a flash, prepare the dressing and cook the beets in advance. Store in the refrigerator and toss the components together when ready to eat. The recipe may easily be cut in half. The dressing will keep for approximately two weeks when stored in an airtight container in the fridge. To make the vinaigrette, in a jar or small bowl whisk together the balsamic vinegar, avocado or olive oil, honey, salt and pepper. Whisk in the orange juice concentrate, and set aside or store in the refrigerator if preparing ahead. Conversely, you may toss everything together in a large bowl. The first method, however, will ensure a perfect combination of the beets, nuts, and cheese. With a large bowl, the add-ins have a tendency to sink to the bottom. Thaw the orange juice concentrate just enough to scoop out desired amount. You may stir into the vinaigrette when still a bit icy; this will actually help emulsify the dressing. Refreeze any unused amount for future use. Sunflower seeds are a nice addition to this salad. I sometimes sprinkle some over the individual salads. 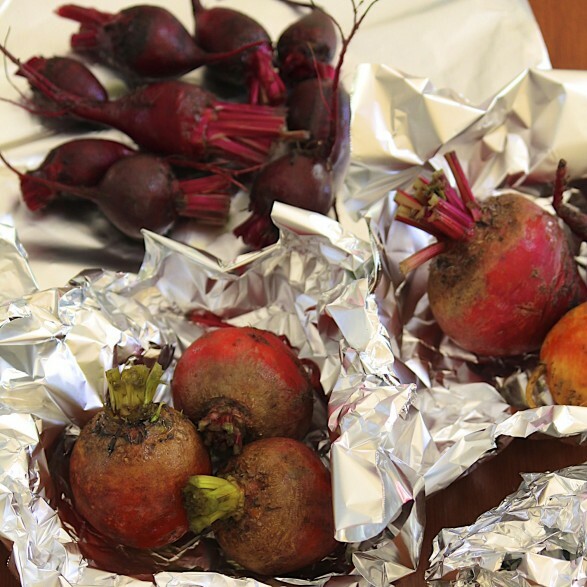 For two great ways to prepare beets with ease–in advance if you choose–click here. This looks so delicious. I can’t wait to try it. Thank you for sharing this recipe.